A NASA type rocket with boost gliders - what a winning combination! The Estes Shuttle Xpress is a new wave of fighter glider technology that carries two gliding fighter shuttles to the skies. 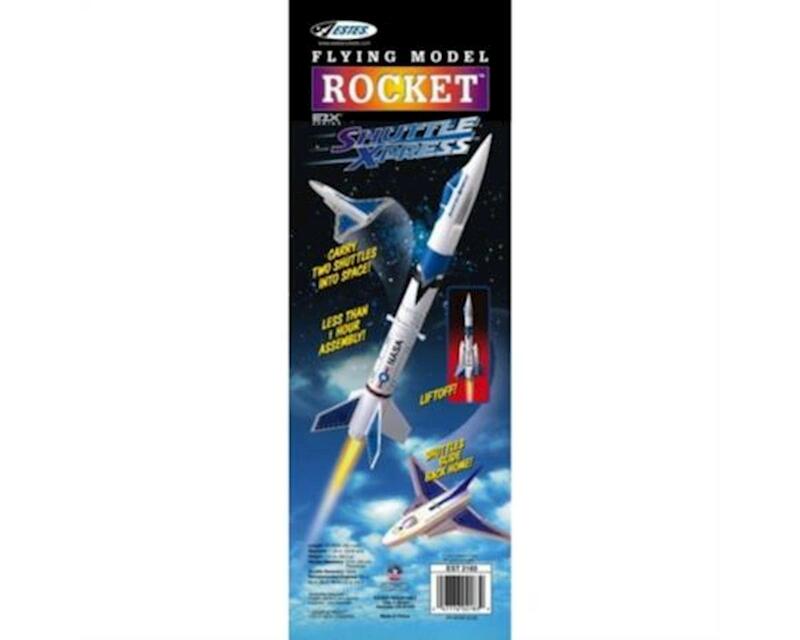 The authentic booster rocket features a jet fighter look with plenty of scale detail and aerodynamic stability. The two shuttle fighters attach to the side of the booster and represent state of the art in stealth glider technology. After launching on a standard C engine, this powerful rocket can soar to over 575 feet (175 m), where the fighters are deployed and can cruise for up to 200 feet (61 m). After the fighters separate, the booster floats gently down on a bright 12 inch (30 cm) preassembled parachute, ready for another exciting search and destroy mission! The Shuttle Xpress is from our E2X (Easy to Assemble) series, which requires no painting and is easy to assemble in about an hour. Special features of this kit are the decorated body tube, molded fin set, molded cockpit nose cone, two foam molded fighters and easy to apply self-stick decals. Take command today of your own high altitude fighter group...get a Shuttle Xpress today! Plastic cement and Estes launch supplies required - sold separately. Recommended for ages 10 and up with adult supervision for those under 12.